100 years in the making, Nilpeter remains a family-owned business. Lars Eriksen and Peter Eriksen, the 3rd and 4th generation of owners, lead Nilpeter towards new historical milestones. 1 May 2019 will be a special day at Nilpeter headquarters in Slagelse, Denmark, as the company celebrates its 100th anniversary. Founded by two old friends in 1919, Nilpeter started out servicing newspaper printing machines in central Copenhagen, before launching its first semi-rotary printing press, The Simplex, in 1924, which in various versions remained part of the company’s product range until the 70s. With the introduction of the self-adhesive substrate, Nilpeter targeted its business towards the label market, and the rest is history. To this day, Nilpeter remains family-owned and -managed, with Lars Eriksen and Peter Eriksen, father and son, and the 3rd and 4th generation of owners, leading the company towards new historical milestones. Today, Nilpeter manufactures printing presses for labels and flexible packaging in three continents: Europe, North America, and Asia. Consistent quality is a key driver, achieved through in-house manufacturing of all vital components, high levels of automation and comprehensive quality control. Nilpeter has a number of subsidiaries, which supports the company’s global customer care strategy to deliver a high level of customer support to both the local and the multinational printing companies. The Nilpeter press design has always been easily recognizable. The Danish tradition for clean design lines mixed with a high level of functionality is a constant priority in the development phase, and is evident in today’s product lines. Nilpeter’s developments in press design cater to a new generation of machine operators that requests a modern operator interface and intuitive handling. The five modern Technology Centers located in Denmark, USA, Thailand, India and Brasil have the latest Nilpeter products on display and provide the perfect scene for engaging with printers. Moreover, co-suppliers and industry partners utilize the facilities to test new technology trends in a local setting. 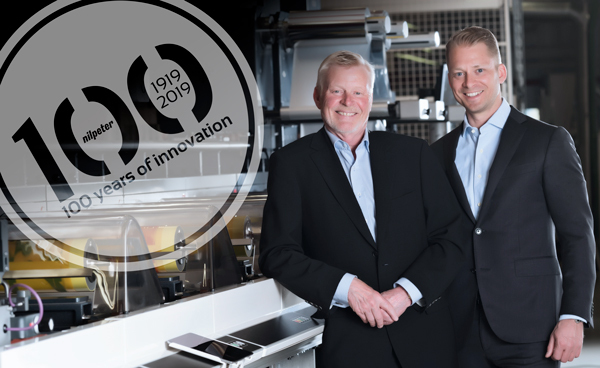 Throughout the years, Nilpeter has pushed the boundaries of technical excellence and created many significant innovations that have shaped the label printing industry – innovations, such as UV-flexo printing, drop-in rotary screen printing and the first true platform-based offset press. Today, Nilpeter is a healthy company with a strong vision for the future.